Chemical vapor deposition (CVD) is the most efficient method to grow large-area two dimensional (2D) transition metal dichiacogenides (TMDCs) in high quality. Monolayer molybdenum disulfide (MoS2) and seed-assistant are the mostly selected 2D TMDC and growth strategy for such CVD processes, respectively. Though the advantages of seed catalysts in facilitating the nucleation, achieving higher yield and better repeatability, as well as their effects on the morphologies of as-grown MoS2 have been studied, the influence of seeding promoters on both optical and electrical properties of as-grown monolayer MoS2 is not known comprehensively, which is indeed critical for understanding fundamental physics and developing practical application of such emerging 2D semiconductors. In this report, we systematically investigated the effect of different seeding promoters on the properties of CVD-grown monolayer MoS2. It is found that different seed molecules lead to different impacts on the optical and electrical properties of as-grown monolayer MoS2. 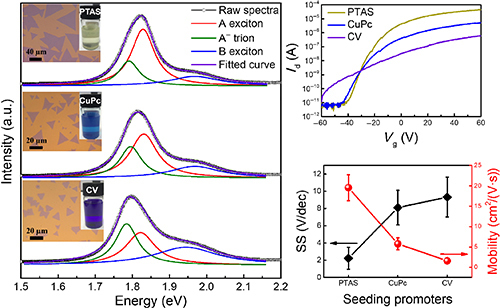 Among three different seed catalysts (perylene-3,4,9,10-tetracarboxylic acid tetrapotassium salt (PTAS), copper phthalocyanine (CuPc), and crystal violet (CV)), PTAS performs better in obtaining large area monolayer MoS2 with good optical quality and high electrical mobility than the other two. Our work gives a guide for modifying the properties of as-grown monolayer MoS2 and other 2D transition metal dichalcogenides in seeding promoters-assisted synthesis process. Peng Yang and Ai-Guo Yang contributed equally to this work. 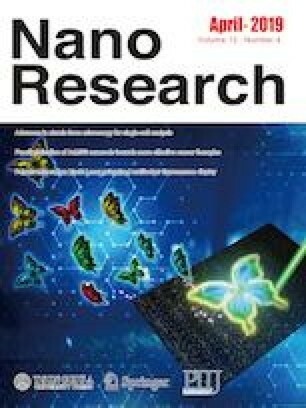 Supplementary material (AFM imaging, SEM images, Raman mapping characterizations, and a table of mobility comparison of monolayer MoS2 FET devices from the literatures) is available in the online version of this article at https://doi.org/10.1007/s12274-019-2294-y. This work is supported by the National Natural Science Foundation of China (Nos. 61774040, 61774042, and 51772317), the National Young 1000 Talent Plan of China, the Shanghai Municipal Natural Science Foundation (Nos. 16ZR1402500, 16ZR1442700, and 17ZR1446500), the Opening project of State Key Laboratory of Functional Materials for Informatics, Shanghai Institute of Microsystem and Information Technology, Chinese Academy of Sciences, the National Key R&D program (No. 2017YFF0206106).